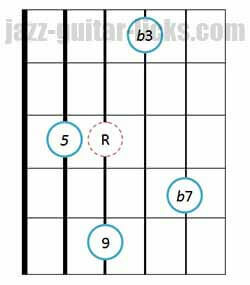 A minor 9th chord is a chord having a root (1), a minor third (b3), a perfect fifth (5), a minor 7th (b7) and a major 9th (9). 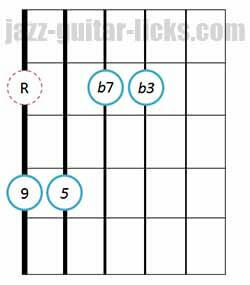 It can be seen as a dominant 9th chord with a minor third or a minor seventh chord with a ninth added. 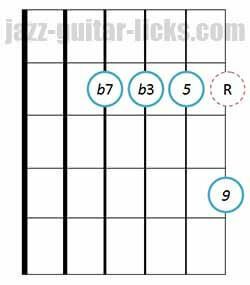 Minor ninth chords can be played in place of basic minor chords when you want to spice you minor voicings up a little bit. 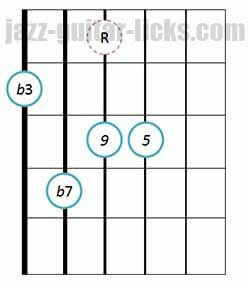 Minor 9th chords are generally marked with a m9 or -9. Example with Cm9 or C-9. 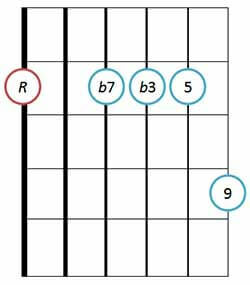 Here are three basic minor 9 guitar chords to learn before moving on minor 9 drop 2 voicings. 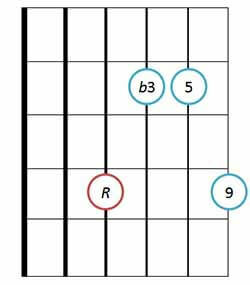 The first diagram contains the five notes of a minor 9 chord. 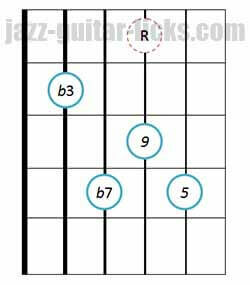 You have to bar with your first finger to get the root (R), the minor 7th (b7), the minor third (b3) and the fifth. The second position has no fifth and the third shape has no minor seventh. 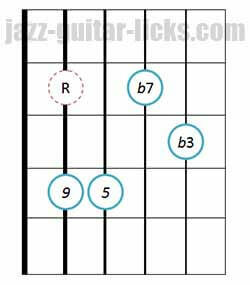 This following focuses on rootless drop 2 minor 9th chord positions. 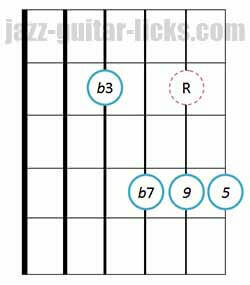 Because it is not always possible or easy to include all chord tones when you play 9th chords, you have to leave some chord tones out. As it is the case here, the root is ommited. Please note that it is important to locate the root even if it is not played. 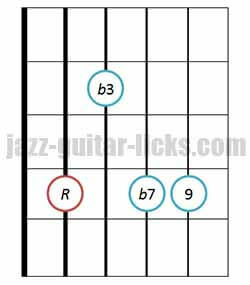 Root notes are dotted in red in the following diagrams. 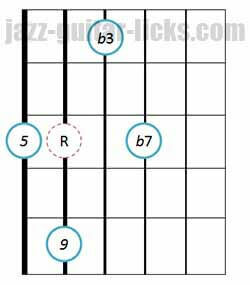 This will help you find more easily the chord position on the guitar neck and as well as its name. 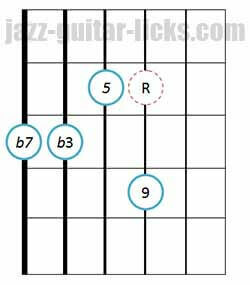 The construction of minor 9th chords can be based on drop 2 minor 7th chords. It's quite easy, you just have to replace the root with the ninth. 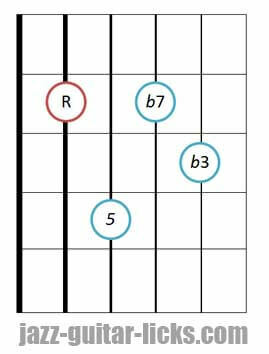 Here are two guitar diagrams that show the relation between these two chords. 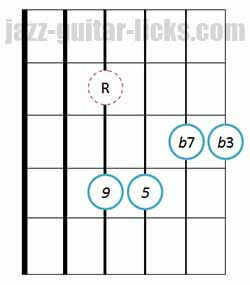 Here are the drop 2 voicings related to the twelve minor 9 guitar diagrams below. 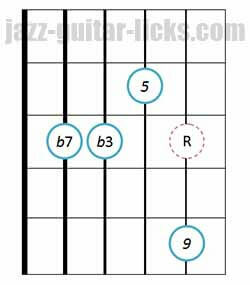 As you can see there can be a ninth, a minor third, a fifth or a minor seventh in the bass.